I want to raise kids who change the world. But some days it feels like the world is changing us. Sometimes the tension between the two– leaves us in a hard place and in a home without a lot of joy. I’ve learned that giving our kids (and myself) more stuff isn’t how we fill our homes with joy. Instead when we apply God’s upside kingdom economics, we find purpose and deep abiding joy by sharing what we have–instead of keeping it to ourselves. The true goal of parenthood is for us to create an environment at home that fosters a desire to change the world. We do this by showing our kids that giving is ultimately receiving, instead of the other way around. 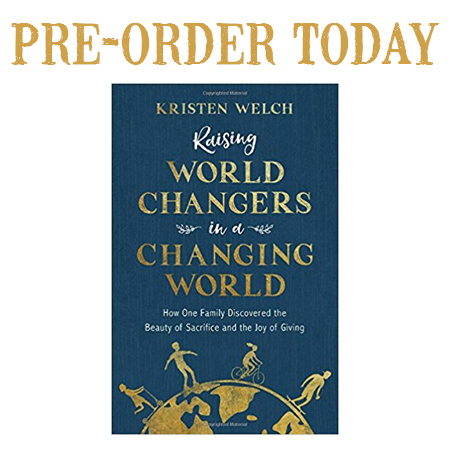 I’m so excited to share my new book with you that’s available for pre-order today: Raising World Changers in a Changing World: How One Family Discovered the Beauty of Sacrifice and the Joy of Giving. It’s not written by a parenting expert (obviously) with all the answers and the perfect kids to prove it. No, it’s written from the trenches. I’m there with you on this broken and beautiful path called parenting trying to figure out what to do next. This book is a glimpse into what it looks like to truly give our lives away with gut-wrenching and soul-splitting stories of hope. Mostly, this book is an invitation to walk this parenting road together. We will discover how to instill in our kids the profound joy that comes from sharing what we have been given–our time, our talents, and even what’s in our wallets–with those who have less. This book is filled with powerful personal stories as well as stories from Scripture. This book offers a tantalizing alternative to status quo parenting that has the power to impact not only our own families but the entire world. At the end of each chapter, there are giving challenges as well as conversation starters with my kids own kids as they offer their perspective on what it’s like to be raised as a world changer, in their own words. So, yeah, this book talks about generosity–but really–it’s about joy. And I am so thrilled to walk this journey with you! This isn’t just another book to buy–it’s a challenge, a calling, a come-as-you-are commitment to raise world changers in a faith community! So, yeah, pre-order the book and provide a fair trade job! 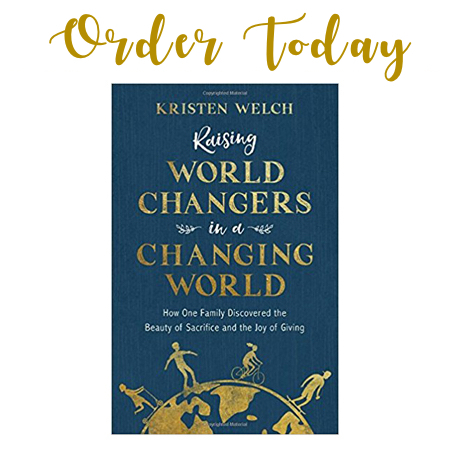 Order while supplies last–there is a limited amount, so pre-order Raising World Changers in a Changing World today.